WASHINGTON, D.C. — With a critical midterm U.S. Senate election approaching — one that could help decide which party controls the upper chamber — about as many North Carolinians lean or identify Democratic (42%) as they do Republican (41%). This effective draw between the two major parties demonstrates the extent to which political attitudes have shifted in North Carolina since 2008, when Democrats had a 10-percentage-point advantage over Republicans in party leanings (49% vs. 39%, respectively). That same year, Democratic Sen. Kay Hagan, who is currently competing for re-election, was initially elected by roughly nine points amid a strong Democratic year, nationally. Party identification and a number of other political and economic measures for North Carolina are included in Gallup’s new State Scorecard assessments, which present data for 14 key measures for each of the 50 states. Within each assessment, the state’s performance on the measure is compared with the national average for the same time period. Despite these setbacks, current polling shows Hagan running neck and neck against her Republican opponent, Thom Tillis, and many analysts consider the race a toss-up. Nonetheless, Democrats have lost their huge advantage in party identification that was extant in 2008 — though official state data still show them leading in voter registration — and political attitudes, as measured by self-reported political party identification, today are closer to where the state was in 2010 and 2012, both good years for North Carolina Republicans.Democrats were extremely successful in North Carolina in 2008. Barack Obama was the first Democratic presidential candidate since Jimmy Carter to carry the state, and Hagan defeated incumbent Republican Sen. Elizabeth Dole. But Democrats’ luck in North Carolina has since wavered, with Republicans scoring a number of state electoral victories, including takeover of the state legislature in 2010 and winning the governor’s race in 2012, which broke the GOP’s 20-year losing streak for that office. President Obama also narrowly failed to carry North Carolina in his 2012 re-election bid. These results come from aggregated Gallup Daily tracking data for the first six months of 2014, from Jan. 1 to June 30. 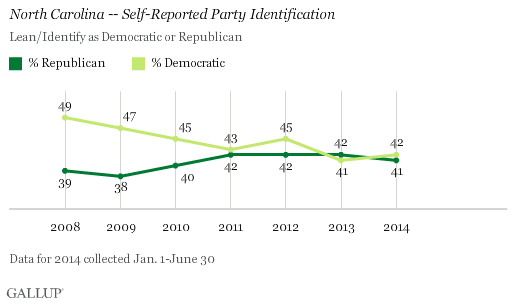 Party identification has followed a similar pattern nationally, with Democrats’ lead over Republicans shrinking from 13 points in 2008 (50% vs. 37%, respectively) to four points thus far in 2014 (43% vs. 39%). A key indicator included in each State Scorecard is presidential job approval, always an important predictor of midterm election outcomes. At 41% in North Carolina, Obama’s job approval rating for the first six months of this year is middling at best, but close to the national average for the same period (43%) and much higher than in other Southern states that Senate Democrats hope to win, such as Arkansas (33%). Among the states that Mitt Romney won in the 2012 presidential election, North Carolina gives Obama one of his highest approval ratings, along with Georgia at 42%. Certainly, Obama is not a particularly popular figure in North Carolina — a state he is visiting on Tuesday — but his support is not cratering either. This could mean that attempts to sink Hagan by linking her to Obama only carry so much traction. According to Gallup’s State Scorecard, North Carolina lags behind the 50-state average of 58% confidence in state government: 51% of North Carolinians have a “great deal” or “fair amount” of trust in their state government, while 47% express low or no confidence. Consistent with their party’s complete control of the state government, over six in 10 North Carolina Republicans say they have a great deal or fair amount of trust in the state government (62%). 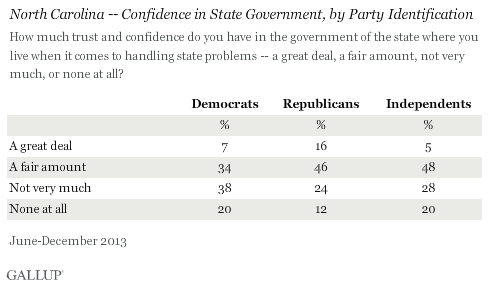 Less than half of Democrats (41%) express similar confidence. Though the Senate election represents a run for federal office, confidence in state government could prove especially relevant, as Hagan’s opponent, Tillis, is the state House speaker. On several metrics, North Carolina’s economy is rated worse than average by its residents. While confidence in the state’s economy is in positive territory (+8), it ranks far lower than the average economic confidence index score for all states (+23). Additionally, less than a third of North Carolinians (30%) believe it is a good time to find a job in their local area — 10 points below the 50-state average. Meanwhile, at -20, North Carolinians’ confidence in the national economy ranks 30th among the states and is slightly worse than the national figure of -16. North Carolina’s midterm Senate race looks to be one of the most competitive in the country. Gallup data show that North Carolina has lost the Democratic tilt it possessed in 2008, and that the two major parties are now nearly tied in self-reported party identification. 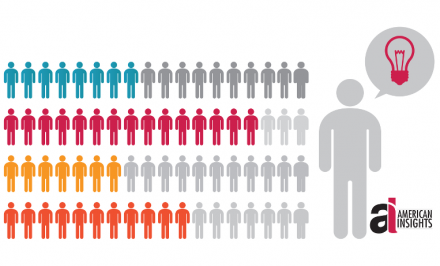 As with all elections, especially midterm, turnout will be a deciding factor — revealing which party or constituency is most motivated to vote. The dynamics of internal North Carolina politics could make this race especially interesting. As Republican Thom Tillis runs a campaign linking his opponent to President Obama — a fairly unpopular figure in North Carolina — and other national Democrats, Democrat Kay Hagan is trying to run against the Republican-led state government and its perceived excesses. Both campaigns see themselves as a way to fight back against political extremism: either the alleged liberalism of Obama and his allies, or the supposed radicalism of the GOP state government. Given this framing, North Carolinians would appear to be making a monumental decision when they go to the ballot box in 10 weeks, and one that could help determine which party controls the U.S. Senate. But given their sour ratings of the state’s economy, many voters may be thinking about economic issues rather than the larger political message of their vote. The determining factor for this race may be whether more North Carolinians fault Obama and Senate Democrats such as Kay Hagan for the state’s underwhelming economic performance, or the Republican officials in charge of the state government in Raleigh.